Fire TV Stick expands Amazon's video streaming product range | What Hi-Fi? It has only been a few days since the UK debut of Amazon's Fire TV set-top box, but the online retailer has further expanded its video streaming product range with the new Fire TV Stick. The streaming dongle is set to start shipping in the US on 19th November at a cost of $39, now available for pre-ordering. And the device has Chromecast and Roku firmly in its sights. In much the same manner as its marketplace rivals, the Fire TV Stick plugs into a HDMI port on a high-definition TV to open up a wide range of film, TV, music, gaming and other services. And it sounds as if Amazon are pulling out all the stops to make the market its own, with its new streaming stick packing in a dual-core processor, 1GB of RAM and 8GB of storage. According to the company, the Fire TV Stick comes with two times the amount of memory found in Google's Chromecast and Roku's streaming stick – together with greater processing power. It also includes features found in Amazon's Fire TV set-top box – such as Voice Search function and Advanced Streaming and Prediction (ASAP) to predict what you might want to watch next. The Fire TV Stick is able to "mirror" your smartphone and tablet display on the TV if your device is Miracast-enabled, and you'll be able to "fling" media content from such devices as well. If you own a Fire tablet or smartphone, the Second Screen function will show X-Ray information while your movie or music plays, which will open you up to a smorgasbord of relevant details. 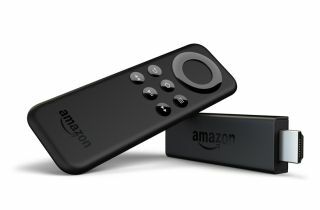 A remote control is included following customer feedback, while the Fire TV Stick will – like the set-top box – come with your Amazon details pre-loaded for ease of set-up and use. The leading streaming services are among the supported apps, (Netflix, Spotify, Pandora and Amazon Prime Instant Video are present, to name just a few) with more expected to be added. Amazon's Jeff Bezos said: "Fire TV Stick is the most powerful streaming media stick available. The team has packed an unbelievable amount of power and selection into an incredible price point."